Released in 1994 Night of the Demons 2 is one of the rare sequels that’s held in the same regard as the original and while I liked the sequel I felt the original was much better. In 1988 Night of the Demons was a box office success and has remained a cult favorite and the sequel came out 6-years later. By the time Night of the Demons 2 came out little did we know but the B-movie as we knew it would greatly change. I break the 90s down as pre-Scream/Michael Bay and post-Scream/Michael Bay. With the emergence of Michael Bay Hollywood would change and not for the better and in 1996 Scream while a great film would reinvent the horror genre and while horror was always a popular genre it wasn’t really embraced by Hollywood since the 40s. A lot of the companies that embraced the genre weren’t one of the major studios, but just a bit below and even New Line Cinema in the 80s wasn’t a huge Hollywood studio yet. After Scream within a year or two the B-movie at least in the horror genre was really changing and by 2000 it seemed it was either Hollywood or Z-grade schlock. And that would also apply to B-movies as a whole. Night of the Demons 2 structure wise is a lot like the original and as I stated many feel its as good as the original. 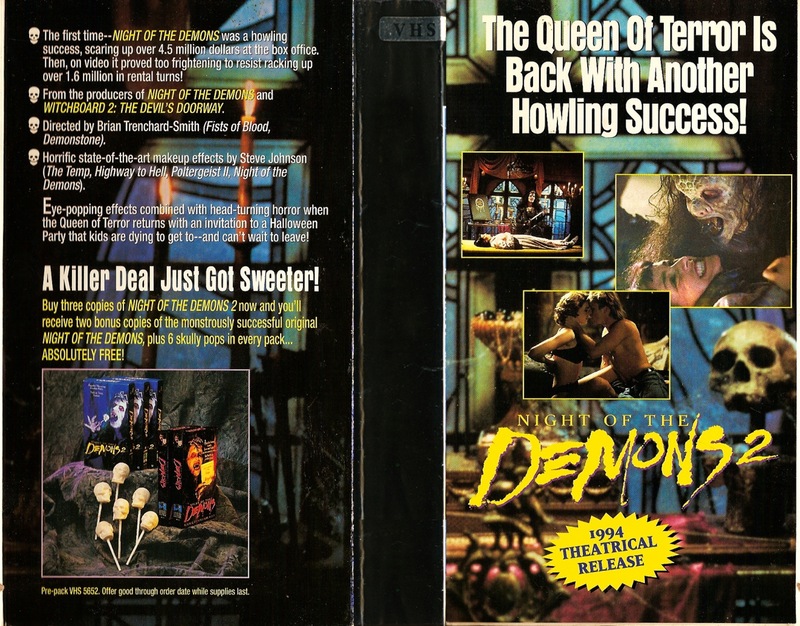 The original film had a sense of humor about it, but also had scenes meant to entice suspense and while Night of the Demons 2 is the same way it seemed to aim to be light and fun all the way through with a little suspense mixed in. Even though I liked the sequel I think the problem I had is it really doesn’t offer anything new like many sequels and while some can still very much succeed others can fail and while by no means is Night of the Demons 2 a failure as its a fun film, but as far as horror sequels go I’d place it around middle of the road. When I first saw Night of the Demons 2 I actually liked it a little more than the original, but over the years the original has held up for me, but this one even though I enjoyed it the film doesn’t hold up as well for me. It’s Halloween night and a few teenagers from St. Rita’s Acedemy decide to party in the infamous Hull House not believing the story that happened a few years ago. But when one girl takes lipstick from the house she unknowingly frees Angela (Kinkade) and Angela crashes the Halloween party being held at St. Rita’s. The screenplay was written by Joe Augustyn who also wrote the original film. The script is more or less the same as the original and while a fun script isn’t as entertaining as the original. The characters in the first film were mostly obnoxious and not all that likable except Angela and Suzanne, but the characters were an entertaining bunch, which in a weird way also made them kind of likable to some degree. However the characters in the sequel are also quite obnoxious, but not as fun and a little more annoying. With that said they have their moments and I didn’t dislike them outside of the ones I was meant to, but I also didn’t really connect with them. Overall the script is fairly strong as far as low budget horror sequels go, but it just for me followed the original a little too much. Director Brian Trenchard-Smith from the opening sets up a fun tone and for the most part is able to retain that. Like the original film this one also takes a while to get going and its not until the middle when it starts to pick up, but most of the action is saved for the final act. Whereas in the original the pacing remained strong for the most part the pace here can start to lag and I was losing a little bit of interest as at 95-minutes Night of the Demons 2 does feel a little overly long. Pacing problems aside, Trenchard-Smith does deliver a well made film with some really fun moments with some excellent gore scenes. There is some decent suspense, but the film plays more up to just being fun rather than suspenseful. Had this been a little shorter Night of the Demons 2 would have been better off, but with that said Brian Trenchard-Smith delivers a fun sequel. The cast was quite strong with some notable faces such as Christine Taylor who in one scene is referred to as Marcia, which was something the actor who said it came up with since he thought she looked like Marcia from the Brady Bunch and not long after this she would be cast in the Brady Bunch Movie playing you guessed it Marcia. The line was actually said by Rick Peters who played Rick and Peters would later star in the TV series Sue Thomas F.B.EYE. Also in the cast was Jennifer Rhodes as sister Gloria and Rhodes also appeared in Slumber Party Massacre II and she’s probably best known for playing Penny ‘Grams’ Halliwell on the TV series Charmed. In my opinion Jennifer Rhodes steals the show in a truly hysterical performance. Overall Night of the Demons 2 is a fun film, but its just a little overly long in my opinion. The cast is strong as are performances and none are better than Jennifer Rhodes and Amelia Kinkade who’s great as Angela. Like I said many feel this one was just as good if not better than the original and while I disagree its still a fun ride.